have electric cords and replaceable bulbs. 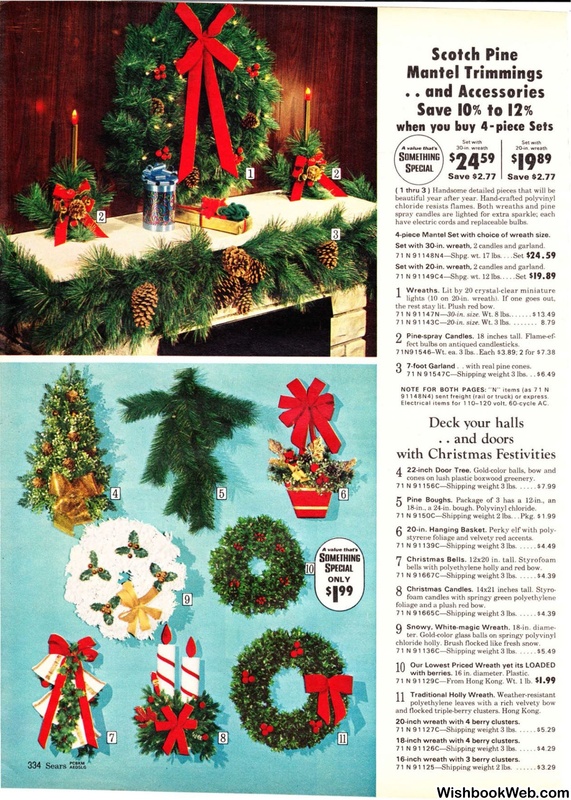 4-piece Mantel Set with choice of wreath s ize. Set with 30-in. wreath, 2 candles and garland. Set with 20-in. wreath, 2 candles and garland. lights (10 on 20-in. wreath). the rest stay lit. Plush red bow. fect bulbs on antiqued candlesticks. 7-foot Garland .. with real pine cones. 91 14 8N4) sent freig ht !rail or truck) or express. Electrical items for 1 10- 120 vo lt. 60-cycle AC . cones on lush plastic boxwood greenery. 71 N 91156C--Shipping weight 3 lbs. 18-in., a 24-in. bough. Polyvinyl chloride. styrene foliage and velvety red accents. bells with polyethylene holly and red bow. foliage and a plush red bow. chloride holly. Brush flocked like fresh snow. with berries. 16 in. diameter. Plastic. 7 1 N 9 1129C-From Hong Kong. Wt. 1 lb. and flocked triple-berry clusters. Hong Kong. 16-inch wreath w ith 3 berry clusters. 71 N 91125--Shipping weight 2 lbs.